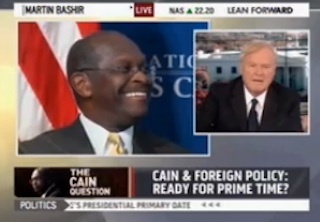 This afternoon, Martin Bashir invited MSNBC colleague Chris Matthews onto is program to discuss both the personal and policy-related issues surrounding GOP presidential hopeful Herman Cain‘s campaign. No. And the reason he’s not is he is not prepared even to the point of being a newspaper reader. I can tell — we all can — when someone is unfamiliar with a term like “neoconservative,” which has been at the heart of the whole debate over the war with Iraq, with of course the neoconservatives fighting very hard to wage that war and others opposed to them for that reason. To not know that the Chinese have had, the PRC has had nuclear weaponry since the 60s is ignorance. These are facts of our fundamental national and international situation. Matthews added that, while he encourages rhetoric meant to take elitist attitudes to task, he can’t support anti-intellectualism or anti-academic prejudice.